The two day course is full of Games, Videos and Simulations. We will be playing with Dice, Legos and Airplanes to make the Lean Six Sigma Methodology come to life. You will not be sitting down long. Your team will be introduced to the basic concepts and tools of both Lean and Six Sigma. They will be able to participate as a core team member or subject matter expert (SME) on a Lean Six Sigma projects. We will be using the Lean Six Sigma Yellow Belt tools to take you through a detailed root cause analysis of your organization’s opportunities. We develop a project charter using a “Quad Chart”. We will use a SIPOC to verify our focus. We move on to a Value Stream Map to uncover waste. 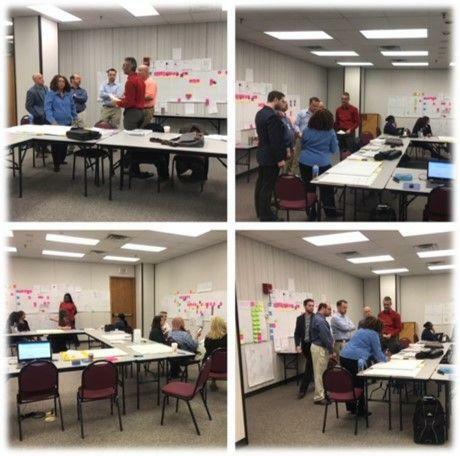 The team then develops a “Quick Change Process Map” to dig deep into the process. We then use Fishbone Diagrams to uncover the root causes of the issue. Last, we identify and prioritize improvements as well as develop a detailed project plan for implementation. A Lean Sixs Sigma Yellow Belt typically has a basic knowledge of Lean Six Sigma, but does not lead projects on their own. A Yellow Belt participates as a core team member or subject matter expert (SME) on a project or projects. In addition, Lean Six Sigma Yellow Belts may be responsible for running smaller process improvement projects. These smaller Yellow Belt projects often get escalated to the Green Belt or Black Belt level where a DMAIC methodology is used to maximize cost savings.